Advantage Cumaru™ decking offers a diverse range of beautiful colors. If you are in the market for a decking material that will “wow” year after year then look no further than Cumaru. Cumaru is an excellent option if you are looking for a wood with striking color and individuality. As you can see from the deck pictured above, this hardwood presents a gorgeous display of golden tan to reddish brown colors and dark grain accents. This entry was posted in Cumaru Decking on November 18, 2013 by Mr. Ipe Hardwood. The most common area of a home that needs the most attention is the area surrounding a pool. Pools are a fun and perfect way to relax and have fun during the summer. But the water and constant sunlight can take a toll on materials very quickly. Finding, let alone choosing the correct material, can be a daunting experience, especially if all you are able to find are cold plastics or lifeless concrete. This homeowner found natural Cumaru to be the ideal material to surround his pool with. Cumaru is the closest natural wood to Ipe with all of its attributes but at a much lower cost. Cumaru also features light brown and red colors that contrast well with the clear water of any pool. If versatility and beauty aren’t reasons enough to choose Cumaru, you can feel safe knowing that Cumaru has great anti-slip properties that make it ideal where kids and family often run around. All of these wonderful qualities inclined this homeowner to choose our Cumaru decking for his pool. Hear from the home owner about all of the fun that this deck has brought and how Cumaru has stood up to the many uses that it has been put through. This entry was posted in Cumaru Decking and tagged Pool Decking on November 1, 2013 by Mr. Ipe Hardwood. To fully enjoy the outdoors with the comfort of the indoors, you don’t need to visit a cabin or go camping in the wilderness; all it takes is a sturdy and well-built deck. 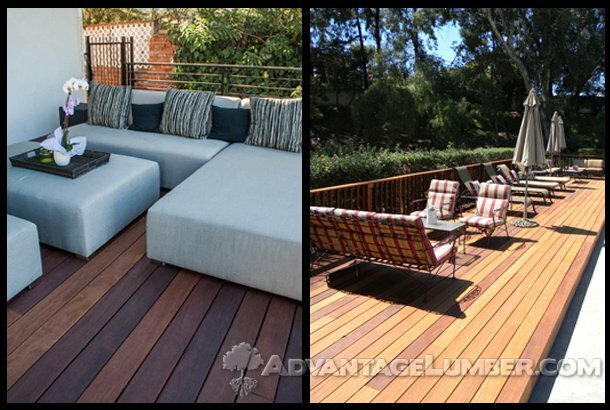 Advantage Lumber provides you with the necessary materials to build the deck of your dreams that will be enjoyed by your family and friends. In this video you’ll hear from Wayne Hitt, owner of WL Hitt and Associates about his experience with a very warm and welcoming hardwood, Cumaru. He used Cumaru for both his home and for his client. As you’ll see he brought warmth and charisma to the outdoors of both properties with our Cumaru wood. The tongue & groove profile was used to complete an outdoor covered porch, furnished with couches and a big screen T.V to watch Georgia Bulldog games in the fall and winter. With Cumaru, you can enjoy the outdoors with exceptional comfort, at a lower cost than similar decking materials. Our Cumaru wood is more affordable than Ipe but features nearly the same strength and density with lighter colors to brighten up your home. Don’t take our word for it; watch the following video to learn how Cumaru decking brought nature to his home. This entry was posted in Cumaru Decking, Wood Decking on October 30, 2013 by Mr. Ipe Hardwood. I know you’ve probably been tempted to purchase those little wood tiles to make a quick fix to the eye sore you call your backyard. You know, the ones found at those big name stores filled with products that will last maybe a year (If you’re lucky!). Well if you bought them, I’m really quite sorry. But it’s not too late to fix that mistake before those flimsy tiles start breaking on you and you become really frustrated. The solution to your predicament is Cumaru deck tiles from AdvantageLumber.com. 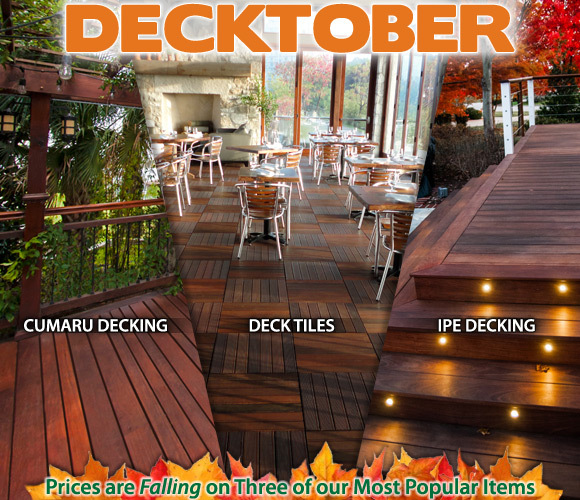 Nearly the strength and stability of Ipe deck tiles, our Cumaru tiles come with a very convenient price. Not to mention, the golden to red amber colors of our sustainably harvested Cumaru is completely stunning. They make any and every outdoor space shine. Once you’re done installing, you will never want to leave your new patio! You can sit back and enjoy your very wise long-term investment. Call, or visit AdvantageLumber.com to order your Cumaru deck tiles today! This entry was posted in Cumaru Decking, Decking Tiles, Exotic Hardwood, Wood Decking on October 12, 2013 by Mr. Ipe Hardwood. So, if you’ve been looking for a reason to start building or renovating a deck or patio, this is it! Remember, premium grade materials, low shipping costs, and expert customer service is just some of the benefits you receive from buying from us. That’s the Advantage Difference. To get your free quote, please call 1-877-232-3915, or visit our decking sale page. *Lower pricing special INCLUDES pregrooved, tongue & groove, shiplap and rainscreen siding profiles. This entry was posted in Cumaru Decking, Decking Tiles, Ipe Decking, News, Wood Decking and tagged deck tiles sale, Decking Sale, discount decking on October 7, 2013 by Mr. Ipe Hardwood. During our visit to Baltimore for the 2012 DeckExpo, some of our employees visited the historic USS Constellation. While they were learning about the history of this vessel and its role in United States history, they also noticed that the interior walkways of the ship were made of Ipe. Inside this historic ship which had such a vital military role in the shaping our nation, Ipe decking was chosen to be the material that supports people during their visit. Take a look at the slideshow below to see how pristine the wood looks despite being used in such a high traffic area. In this same slideshow you’ll also see an example of how Cumaru wood is used for a marine siding application. This beautiful Brazilian hardwood was used to wrap around the Inner Harbor Cruises ticket booth. Take note of how evenly and smoothly the wood is weathering despite the fact that it’s surrounded by salty water and air. Last but not least, we have another example of how composite decking reacts when used for commercial projects. It you inspect closely, you’ll discover how this plastic decking is failing under the sun and everyday use. Imagine what it will look like in just a few years! If you’d like to learn more about how Advantage Ipe™ and Advantage Cumaru™ will work for your commercial or marine project, give us a call 1-877-232-3915 and take advantage of our Fall Decking Sale. This entry was posted in Composite Decking Reviews, Cumaru Decking, Ipe Decking, News, Wood Decking on October 22, 2012 by Mr. Ipe Hardwood. Sure, it’s one thing to say you will build an enduring and beautiful deck for much less than 5/4×6 decking, it’s another to see it in action. In less than two minutes, this video will give you the rundown of all the benefits and functionality of the “sweet spot” decking. You’ll also get to hear a contractor talking about what it’s like to use it. Get your custom 1×6 +Plus® in either Ipe or Cumaru decking quote call 1-877-232-3915. This entry was posted in Cumaru Decking, Ipe Decking, Wood Decking on August 8, 2012 by Mr. Ipe Hardwood.